It is important to remember that Notaries Public cannot certify copies of documents. Copies of Public Records can be certified by a public record keeper such as the Secretary of the State or Town Clerk. Vital Records such as Birth Certificates [, Death Certificates, and Marriage Certificates can only be certified by Town Clerks, Registrars of Vital Statistics, or the Commissioner of Public Health Unit. 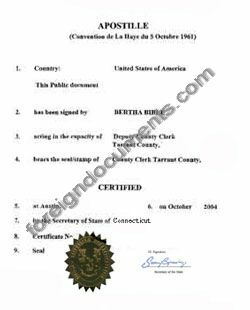 Certified copies of corporation documents: Articles of Incorporation, Articles of Amendment, Articles of Merger, Articles of Dissolution, Certificate of Status can only be certified by Connecticut Secretary of State.